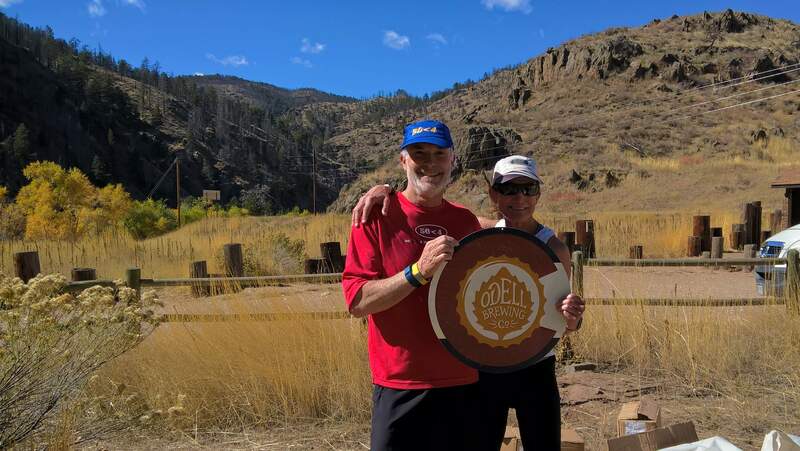 About a month ago I received an email from Bob, the president of the 50sub4 Club: an organization whose members share the goal of running a marathon in all 50 U.S. states in under four hours. 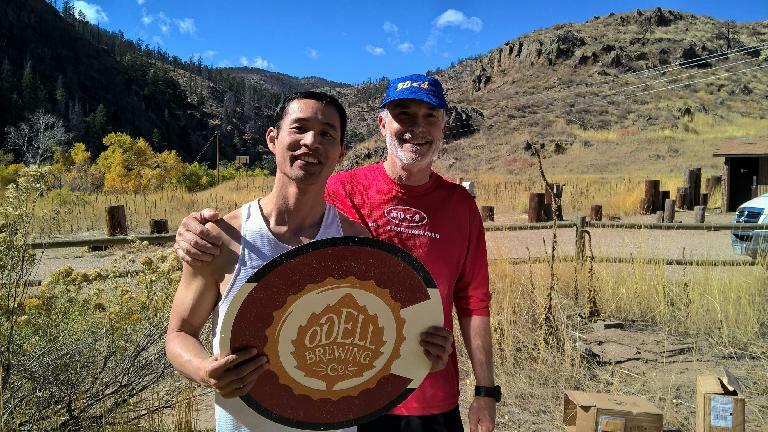 He was planning on putting on an October marathon down the Poudre Canyon—a beautiful gorge northwest of Fort Collins—and was wondering if I could help recruit some runners and offer some logistical help. “It will be a very special race,” he promised. It did sound intriguing and I quickly committed to both offering support and running in the race. It would be good training for the upcoming New York Marathon, I figured. The Cache La Poudre Marathon was designed to be a fast course, going down one of the most beautiful canyons I know of and hold dear to my heart, having spent much time hiking, snowshoeing, rock climbing, bicycling, and even cross-country skiing in it. By race day a couple dozen people had signed up for the event, exceeding Bob’s criteria of “at least ten” to be a legitimate race. 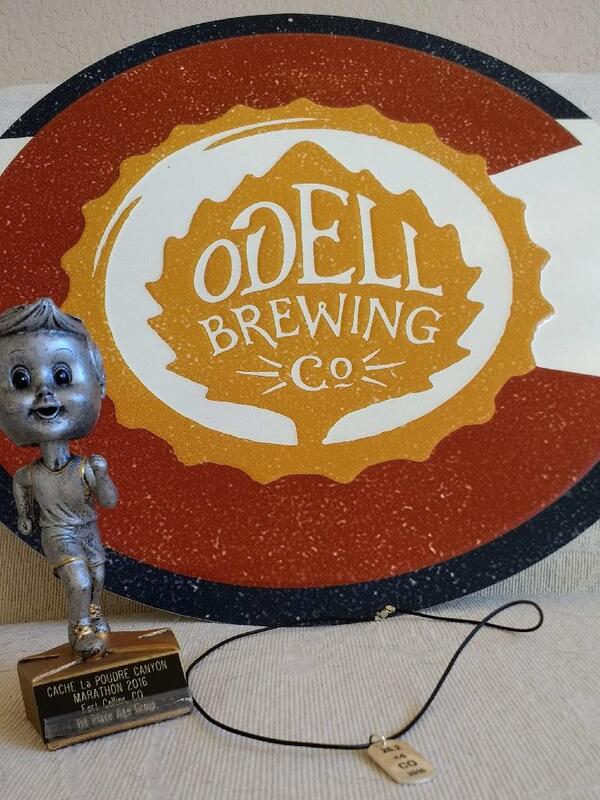 The day before the run we met almost all participants in the Odell and Fort Collins breweries for beer and dinner. They were folks from all over the nation: two from New Hampshire, another from Minneapolis, another two from Wyoming, one from Texas, another from New York, and so on. Of the folks I knew included Connie, a friend who happens to be an amazing runner. 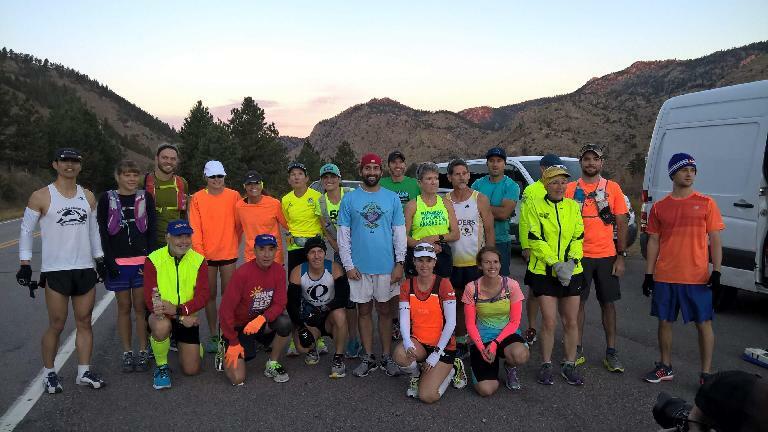 For example, a couple weeks at St. George, she ran a 3:26 marathon… at age 60! To put how fast that is into perspective, that time would have easily qualified for Boston even if she was half or one-third that age. She also managed to recruit her daughter Marissa—who was running her third marathon (or longer distance) in four weeks—and Marissa’s husband Pete a few days before the event. Of the other runners, almost everyone was a veteran marathoner who had done multiple ones in different states, but there were one or two who would be running a marathon for the first time. 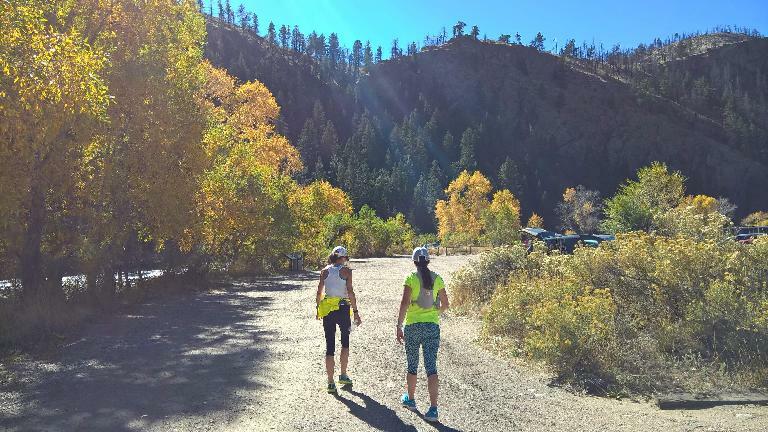 A couple people mentioned that they were looking for a marathon to run in Colorado in October or November, but this was the only one that came up in their search. On race morning we all met in Old Town Fort Collins at 5:30 a.m. before caravaning into the Canyon. 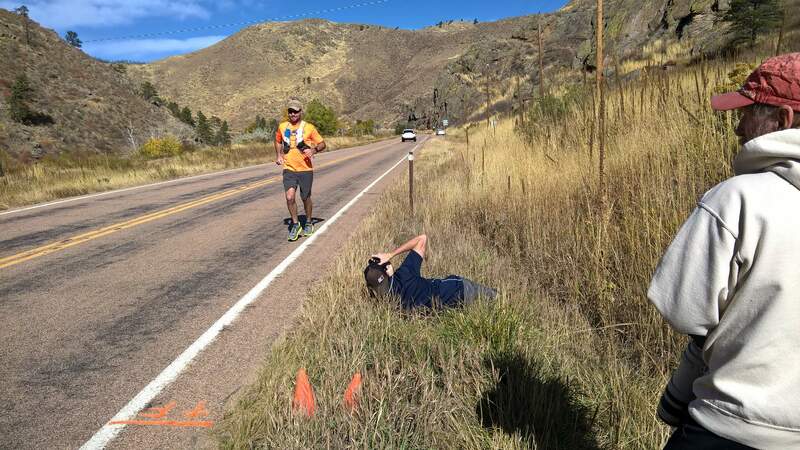 Most of us then left our cars at Picnic Rock where post-race festivities would take place, and then some volunteers shuttled us up to Colorado Highway 14 mile marker 94 which was the official starting line. 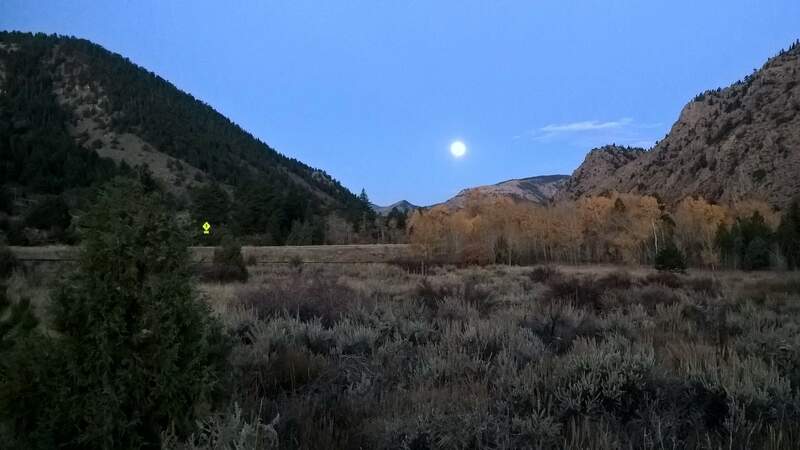 A beautifully full moon lit was setting over then canyon before the intended race start time of 7:13 a.m., which was the time of official sunrise in Fort Collins. Due to taking some starting photos (one of which is below), we actually started at 7:18 a.m. One of the great things about having such a small, low-key race was there was virtually no waiting around for the race to commence. And so I spent a whole lot of time running alone on the road except for the stream of traffic which gradually picked up through the morning. Eventually there were enough cars passing that, more than once, I completely jumped off the road to run through knee-high weeds. Bob had reminded every participant that this was a very dangerous course, with virtually no shoulder and many blind curves, and that of foremost importance was safety first. We also didn’t want any trouble with motorists or, gasp, law enforcement. The race, by design, was small enough to qualify as something of a “group run on a public road,” but in any case no one wanted anyone ending up in an ambulance or, worse, a body bag. The weed- and off-road mini-excursions probably cost me 2-10 seconds per mile due to lost momentum, but I wasn’t worried about that as long as I was running in the mid-seven minute miles. Which I seemed to be doing according to my Microsoft Band 2 and Endomondo App barking out mile splits on my Windows phone. When I crossed over the 13.1-mile marker 1:39 and change had passed (7:35/mile). It was a couple minutes over the 1:37 half-marathon goal I wanted to hit for this race, a margin small enough to not panic over. Plus, there was no sign of anyone behind being anywhere close. I imagined I had at least an eight-minute lead on any other runner. It was a big surprise, then, when at Mile 16 I heard footsteps and a cough. I briefly turned my head around to get a glance of who was behind. It was Michael from New York, one of the thirty-somethings. He looked overdressed but relaxed. He seemed to have bided his time to catch up. And I was starting to hit the point of the race where in the past I have frequently struggled to maintain the pace. I managed to stay steady enough that Michael remained behind for the next couple of miles. Then we encountered one of the few uphills on the course and he made what appeared to be a decisive move. He passed and I offered some encouragement, saying “good job.” Within a couple minutes he already had a 50 meter gap. At that point I assessed the situation and felt like I was not going to be able to offer a serious counter-challenge. Indeed, looking at the Strava data post-race, I had slowed enough that my mile splits were above eight minutes after Mile 19. My goal was now to merely maintain second position even though I was perfectly conscious that anything could still happen, just like when Golden Gate last season faltered after gaining a virtually insurmountable 3-1 lead in the NBA finals over Cleveland. It was now Michael’s race to lose and he could have a Warriors-like collapse. Which is what ended up happening. Michael had a 200, 300, and maybe even a 400 meter lead on me at one point. But I could still see him at Miles 21 and 22. And then all of a sudden, maybe a couple minutes after I lost sight of him, I saw him just ahead—walking. “Oh shoot!” I said under my breath. My first thought was that now we could have something of a battle and that now I was really going to have to push! But when I passed him saying “keep it up; hang in there,” I could kind of see that he was in trouble running-wise. It looked like his legs were done. This was confirmed a few minutes later when I dared to look back and there was no one. It was now a race of attrition and I just needed to keep running steadily to cross the finish line first. There were hot spots on my feet and my legs were feeling pretty weary as they normally do in the last few miles in a marathon. But despite this being a low-key race, there were ample water stations—some self serve but some amazingly manned by volunteers who had tried to leapfrog the runners up the road to hand out liquids—and by this point I had switched over to grabbing bottles of water instead of the Powerade I had exclusively consumed for the first 20 miles. Why only plain water, which lacked any of the carbohydrates or electrolytes of the Powerade? Because I used about three quarters of it to dump on my legs and back to keep cool. Fatigue was definitely setting in and in order to prevent my body from shutting down I kept trying to imagine I had more miles to run than I actually did. E.g., when there five miles to go I would tell myself there were eight; when there two miles to go I would tell myself there were three. At some point I effectively confused myself enough that when I saw the cars at Picnic Rock I was both surprised and pumped. 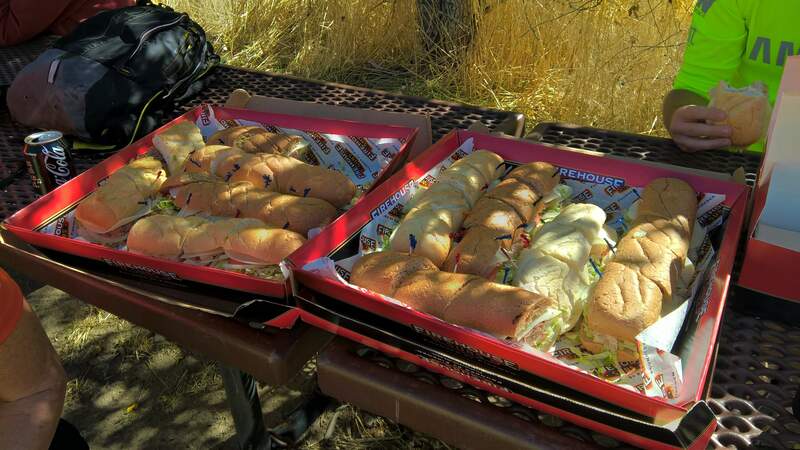 Picnic Rock, Bob had told us earlier, was exactly .6 miles from the finish. I then tried to pick up the pace the best I could, even though I now knew the race was in the bag. I had enough energy to sprint across the finish line with a final time of 3:28:18. I looked on with amusement that the finish line was literally in the front of the family home of my friend Kelly, who had won the last Fort Collins Running Club’s Tortoise & Hare race of the 2011-2012 series. Back in the day I had to do everything I could to cajole her into getting out of bed just to get to the start line in time, if at all. Four years later, I crossed the finish line first in a race that the FCRC played a small role in, right in front of her mom’s house. I think she might have been as happy and proud of me today as I was of her back then. The second place finisher came in ten minutes later. But it wasn’t Michael! It was another person in his early thirties, John Schneid. John reported that Michael was still walking, poor guy. Michael was still strolling when he emerged into view from the finish area with Pete (Connie’s son-in-law) right behind. I yelled at Michael to pick it up so he wouldn’t get passed, but Pete ended up going by him with 50 meters for fifth overall. Michael would later explain that he’s only done short and fast training runs and his legs just couldn’t hold up after Mile 22. Connie was the first female and somehow managed to finish under four hours despite having to walk seven times in the last ten miles. Amazing. We all were a little sad when the four-hour mark passed by and Bob Kennedy, the wonderful man who put this great event and oldest participant at age 68, was nowhere in sight. 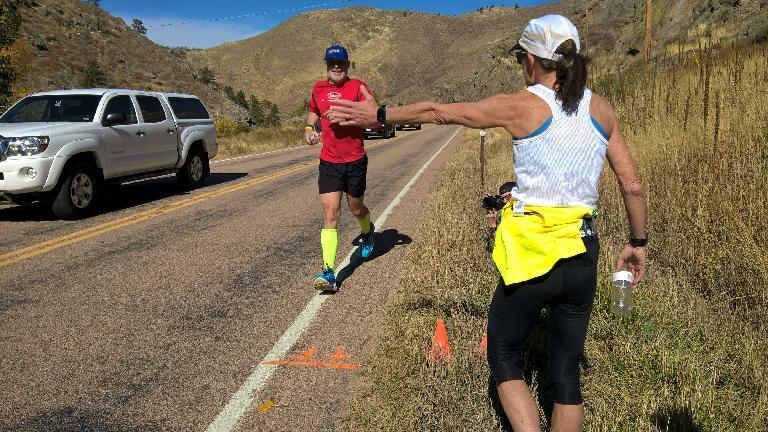 (Colorado is one of the remaining three states he needs to run in under four hours to complete his epic goal.) One of the volunteers reported that at Mile 2.5, Bob said that he could already tell he was not going to go sub-4 on this day. Bob would later tell us that despite finishing over four hours, he was happy with his final time and actually kind of surprised at finishing when he did considering how he was feeling during the morning. It seemed like everyone found the race to be more difficult than we thought it would be and was a bit off their goal times. Yet, most of us agreed this was one of the “best” (most memorable) races we had ever done. I carried two gels in my hat but ended up not using them. My best races still seemed to have been all done consuming only sports drink for energy. In a bid to help prevent cramping, I ate a banana and a pickle and drank a little bit of pickle juice a couple hours before the race. I had no problems with cramping. Thanks to Bob Kennedy for conceiving and organizing the race and for going far above what would be expected of a “low-key” event. Everything from the certification of the course to the runner get-togethers and the post-race party and awards were outstanding. See the photos below of the race schwag! 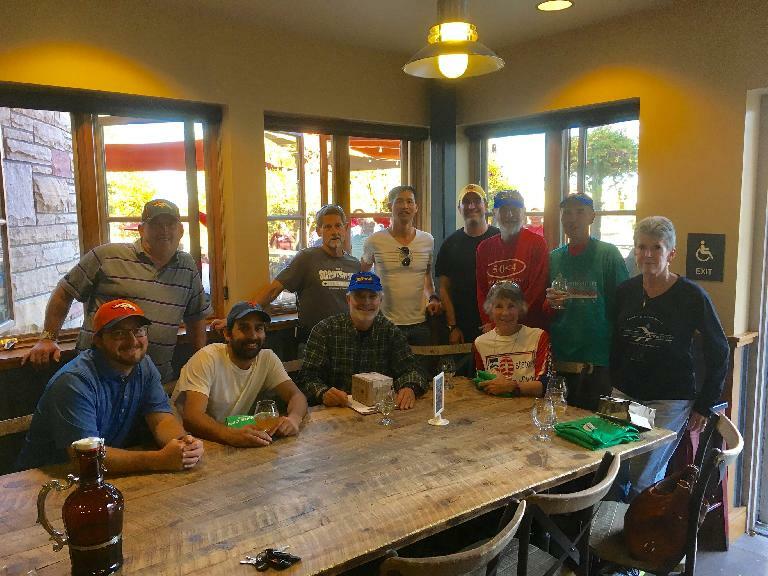 Thanks to the many volunteers; without them the race would not have been possible either. 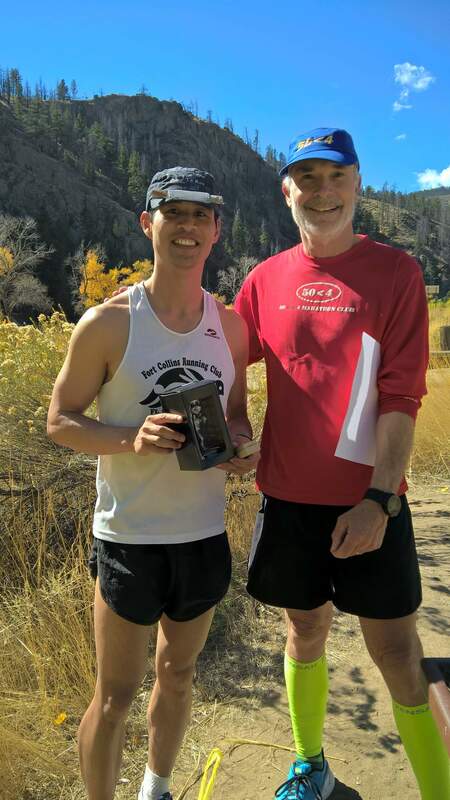 We were graced with some of the “who’s who” of running, including timing by Benji Durden, a Boulder resident that had a faster marathon time than Frank Shorter and was only denied a chance to run in the Olympics due to the 1980 Olympic boycott.